Die Wellen des Ozeans, nur kurz eingeblendet, werden in den ganz unterschiedlichen Kompositionen mit Synthesizer, Harfe, Kongas, Gitarren, Flöten etc. musikalisch verdichtet. Eine der schönsten CD's von Deuter. 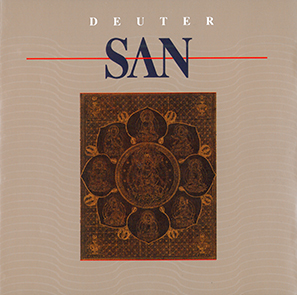 San is an affirmation of Deuter's pan-cultural musical vision. Linking elements of Western musical traditions with the spirituality of Eastern musical traditions, Deuter uses a broad range of instruments and sound from all over the world to communicate an experience of life through music. Deuter explains, "the message in the music is light. Light as opposed to heavy, and light as opposed to darkness. The music is derived from an understanding that life is a gift, and from an acceptance of the miracle that all things exist." Deuter has demonstrated from the start an unusual sensitivity to the possibilities of sound. With the ability to combine diverse sounds into a satisfying whole, he has managed to incorporate rhythms, musical influences, and natural sounds that gently persuade acceptance of all things. San is a perfect example of this pioneering spirit. A leader in creating a dialogue between the musical traditions of different cultures and between cultural expressions of sound and the sounds of nature, Deuter is an original pioneer of new age music. Although innovative in his work, the graceful transitions and sensitive interpretations that characterize his music, carry the listener easily through new territories in sound. Born in Falkenhagen, Germany, in 1945, Deuter grew up playing flute and guitar. After graduation from high school, he moved to Munich, working as a graphic designer and music columnist for a newspaper. A serious car accident in 1970 was a turning point for him. Evaluation of his life and values led him in a new direction. Music and spiritual evolution became his primary concern.